On Friday afternoon I checked out the cross-country trails at Dewey Mountain in Saranac Lake. As expected, the groomed trails were in fine shape, but I was more interested in the ungroomed, rougher trails that lead to the top of the mountain as they more closely mirror conditions likely to be found on many backcountry trails. I hadn’t been on Dewey’s ungroomed trails in several weeks due to a dearth of snow. In the past week, however, we had a few light snowfalls (including two or three inches in the past 24 hours), so I figured they’d be skiable. And so they were, even though the snow is not deep enough to cover adequately the bigger rocks. I scratched my skis once or twice on the descent. My guess is that you’ll encounter similar conditions elsewhere in the Park. Many trails will be skiable, but you have to watch out for rocks. You probably should avoid trails that are especially rocky. Another observation from my ski trips in the past week: there is variability in snow depth even on the same trail. For instance, my friend Carol and I skied the Pine Pond Trail between Lake Placid and Saranac Lake last weekend. In the hardwoods, there was plenty of snow. In fact, we had to work breaking trail in one section. Under hemlocks and other evergreen stands, the cover was rather thin (in places, roots were exposed). 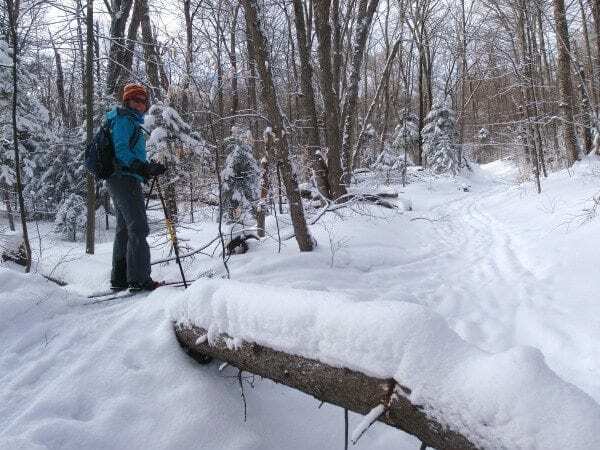 The Adirondack Ski Touring Council reports that the Jackrabbit Trail between Saranac Lake and Keene remains skiable throughout its 24-mile length. Because of rocks, it advises caution on the downhills. 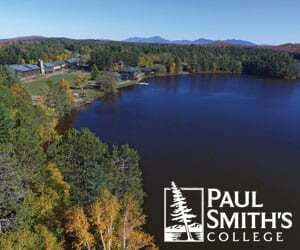 In particular, it mentions the hills above Whiteface Inn Lane in Lake Placid and at the Keene end of the Old Mountain Road section. Carol and I skied the hill above Whiteface Inn Lane last weekend and had no problems with the rocks. Conditions should have improved since. I was in touch via Facebook with two guys who skied the Marcy trail below Indian Falls a few days ago. The ski trail below the falls was reported to be in good shape. Presumably, the hiking trail above the falls (which skiers share) is also in good shape. The stretch along Phelps Brook above Marcy Dam still had exposed rocks. The two skiers (Ron Konowitz and Tom Hall) spent a few hours shoveling snow to fill in the trail. Thanks! 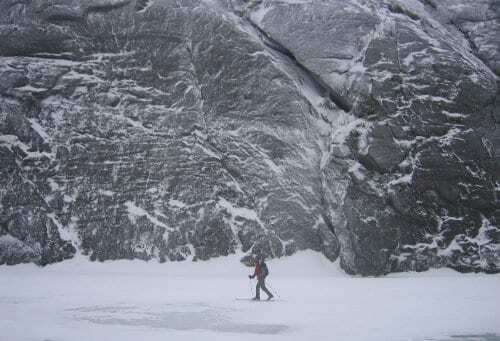 The ASTC says the Avalanche Pass Ski Trail is in pretty good shape. There is 26 inches of snow at Lake Colden and three to four feet above the 4,000-foot contour. 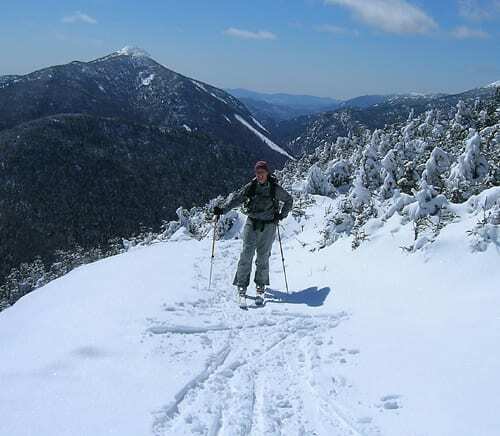 Check out the council’s website for more details about conditions in the High Peaks region. Paul Hai reports 13-14 inches of snow at the Adirondack Ecological Center in Newcomb. 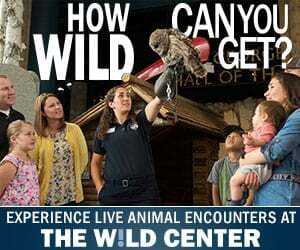 He said skiing is good at the nearby Adirondack Interpretive Center and the road to Camp Santanoni. If you’re thinking of going to Newcomb, you might also check out the brand-new Upper Hudson Ski Loop off Goodnow Flow Road. Deb Paradis reports at least 7-12 inches of base at the Paul Smith’s College Visitor Interpretive Center. All trails are open. Angie Oliver, co-owner of the Wanakena General Store, reports “a foot plus” in her neck of the woods. Conditions are good on the trails to Janacks Landing and High Falls in the Five Ponds Wilderness and on trails at the Wanakena Ranger School. 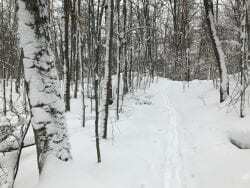 Clark Lubbs, an Old Forge photographer, was out on the Otter Lake Truck Trail in the Ha-de-ron-dah Wilderness and the Cascade Lake trail in the Pigeon Lake Wilderness this past week and reports generally good conditions. Part of the Cascade Lake trail was a little scratchy, but the recent snow may have improved things.